Presurized cooling system ah crud, why? Thread: Presurized cooling system ah crud, why? Unfortunately, i think I know why, but i'm looking for collective knowledge and experience here! so: I have one of those pressure caps on my overflow reservoir - old school - lift the red tab, it releases pressure! But in this case, i can lift that lever 3 days after the car has been driven, and it gurggles and bubbles in the reservoir, once that pressure is released the bubbling stops. anyone want to guess? No white smoke, no haze on the windows, can't smell Antifreeze, so I'm a bit stumped here. I also have what I consider weird temp gauge readings, gauge is accurate, but it shows stone cold when radiator is full and vehicle is running, but acts like there is a bubble in the system other times, with a spike in temp gauge 3/4 toward hot, then immediately back down into cold (within 2 or 3 minutes) I've been been "bleeding the system repeatedly for 2 months now - heater full blast, top up radiator through the cap/bolt, top up reservoir. I'm figuring lets solve the pressure issue first, i suspect everything else will fall back in line after that = so whats your best guess/ experience? Re: Presurized cooling system ah crud, why? Staying pressurized is normal I think. The system can be a PITA to get all the air out. I use a large funnel which screws into the radiator. Cap on reservoir. You can jack the corner up if you want. Make sure to keep coolant in funnel but watch out that it does not overflow from expansion. When t-stat opens you should see a big burp in the funnel... again make sure to keep coolant in funnel so you do not introduce air back into system. Run until all the bubbles go away. Turn off & put cap back on radiator. Let it cool all the way & then check and top up expansion tank. Or as you as speculating.... it could be HG. 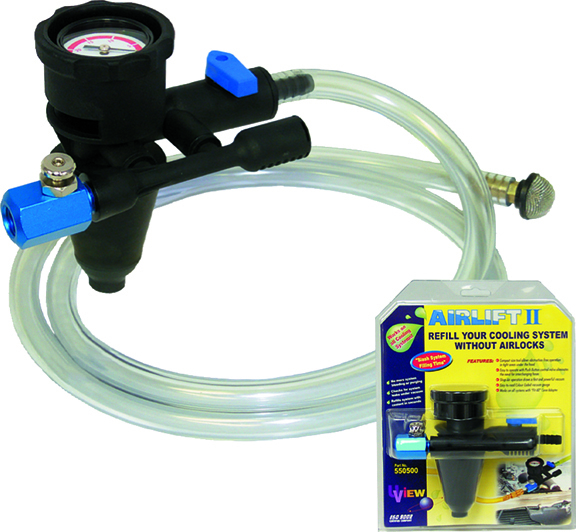 I have used this with excellent results, basically it pulls and then vacuum fills your your cooling system. no more gushing sound, excellent heat, no air pockets which can lead to overheat issues. wonderful for cars with remote mounted cooling systems. I just bought a PVC threaded bit same as radiator (sorry I forget the thread size) and epoxied it to a tall funnel about 12" tall. Can anyone help out with thread size? I do get a bit a seepage from around the threads. Just wrap a shop rag around it. I find this thread interesting because I'm about to replace my water pump this week. Its been leaking from the gasket between the pump and the timing cover. When I did my head gaskets a few years ago I refilled the coolant via the method described in the RAVE manual. Its basically "fill it up, run the engine a bit, fill it up the rest of the way". There's no mention of bleeding air out or anything of the sort. Well, my first big trip after the head gasket and I overheated and blew out a freeze plug on the highway. The mechanic said it was most likely an air pocket that hit the thermostat and closed it up. So i'm curious what you all do to bleed air from the system, because RAVE doesn't address this seemingly critical step. Now that you mentioned thermostat, make sure the jiggle pin is at 12 o'clock when installed. If it does not have one, drill small hole near the lip. Helps to prevent such an air pocket. Fill the system with a running engine, and the heater flat out on, preferably you let the engine run at about 1500rpm while filling. Take it for a short drive, usually the distance your engine is at full operating temperature, let it cool down a bit, 10 to 20 minutes, and top it up, check this about twice, just to be sure. Don't put much stock in the dash temp gauge. It doesn't display much meaningful information about your coolant temps. It's basically a three-state gauge: you're cold, you're fine, you're f'd. On my 1998 Discovery I connect a simple OBD2 scanner and watch precise engine temps in real time from the truck's sensors. The data show wide swings in engine temperature - 160 degrees to 205 degrees - and the dash gauge doesn't budge. I wish I could do the same on my RRC, but I know most of the history of my cooling system so I am not too worried about it. There are aftermarket temp gauges you can install which might give you more peace of mind, or at least better data to use in diagnosis. Bottom line is your dash temp gauge will only tell you the engine overheated when it's too late. System too lean fault codes, why o why? Codes back again. Range Rover on 30's!!! lol haha...Why? Why?? ?